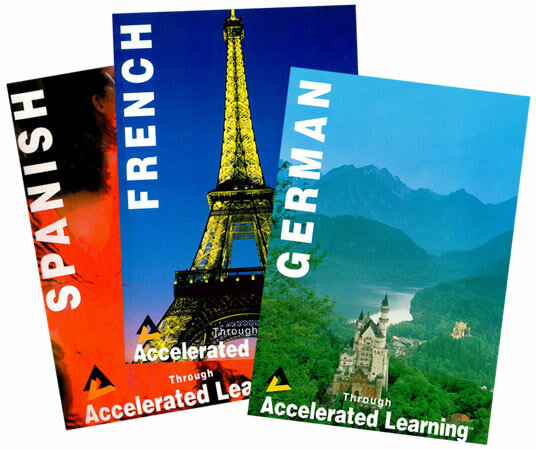 The Accelerated Learning method really does enable you to learn a foreign language quickly and enjoyably. The secret is to closely match the way you are taught with the way you like to learn – your personal learning style. Our language courses have been designed with a whole range of activities to meet your preferred learning style. They innovatively integrate music, pictures, imagery, spoken and written material and interactive games. You will SEE, HEAR and become PHYSICALLY INVOLVED with the new language – reproducing the way you naturally absorbed your native tongue. 25 pages within the main A4 book, which show you the common features of English and the language you are learning. The Name Game is unique to Accelerated Learning Systems. It shows you the surprising number of similarities between English and your new language. 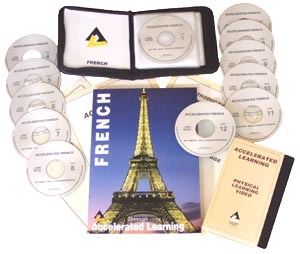 After just an hour’s study of this element of the course, you will be able to deduce the meaning of about 20% of the words in your new language — whether that is French, Spanish or German. It’s a simple, fast basis for building a huge vocabulary. 12 one-hour audio CDs with three versions of the story. You can easily transfer the content of the CDs to your audio player/smartphone. Instead of lessons, you enjoy a 12-act story that keeps you intrigued and involved. The characters encounter all the situations that you would on a typical visit or business trip. From the very first minute, you’ll be listening to real-life dialogue and usable sentences. So you absorb not only the vocabulary you need as you follow the story, but the grammatical structure, too. You hear the Radio Drama in three different forms, so you get the repetition you need to create long-term memory, but the varying versions keep it interesting. A. First there is a Narrated Version. This is an ideal version to listen to in the car. B. Then an Acted Version with different voices and sound effects — like an armchair theatre! You begin to create a ‘mental movie’ of the scenes. C. Finally there is the Concert Review – a very unusual version where the text is spoken dramatically over a background of music. It’s a very memorable technique — and if you think how easy it is to learn the words of a song without any conscious effort, you will understand how it works. The book presents the text in a unique way which helps you understand the new language immediately. Sentences are rarely more than seven words long. Because short sentences are easier to remember. The fact that the English is on the left, and read first, means that you always know what your new language means. So you feel secure — which is important for stress-free learning. This side-by-side presentation means that, even though you may be reading the foreign language, your eye can take in the English in your peripheral vision. So subconscious learning takes place. You also absorb the grammar naturally as you go along. Later, after you’ve already experienced examples of the grammar rules, we point out how they work. This is a much more natural sequence than learning the rules first, which is boring and less effective. Each act of the drama is also represented as a pictorial “memory map” to further embed the new language. The text book also includes unique Memory Maps, which put images to the words, helping you build up vivid mental pictures of the language. You begin to visualise what it’s like to be in France, Spain or Germany. When you recall the images, you recall the words. The language you learn through the radio drama is “activated” with games, puzzles and activities. 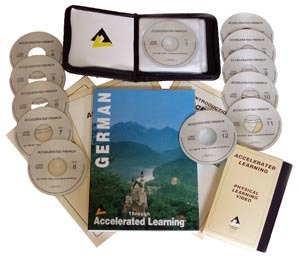 An essential part of embedding your new language is to “activate” what you have learned. It’s a kinesthetic (physical) involvement with games, puzzles and activities – getting you using your new language. The activities are enjoyable and carefully designed to meet every learning style. So they quickly turn that ‘passive knowledge’ into active language you can use in conversations and everyday travel and business. This bonus stand-alone DVD teaches you vocabulary for parts of the body, objects and actions in a physical way. 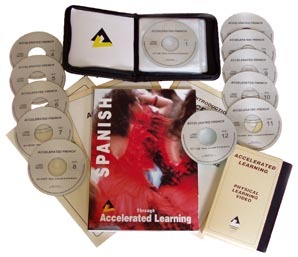 The DVD teaches you vocabulary for parts of the body, objects and actions in a physical way – an exclusive Accelerated Learning technique. You learn a range of physical vocabulary (parts of the body, objects around the house, action verbs) in a physical way. The idea is simple but effective — you watch physical actions on the TV screen (such as ‘stand up’, ‘sit down’, ‘turn round’), you follow those actions and you repeat the words aloud. It becomes a physical immersion in your new language, and reproduces the way that you successfully learned your native language as a child.